A doll’s wardrobe is not complete without a pair of cool and comfy shorts, perfect to spend an afternoon digging in a sandbox. The Sandbox Shorts are a quick and easy project and can be made up in a wide variety of fabrics, with or without working pockets. 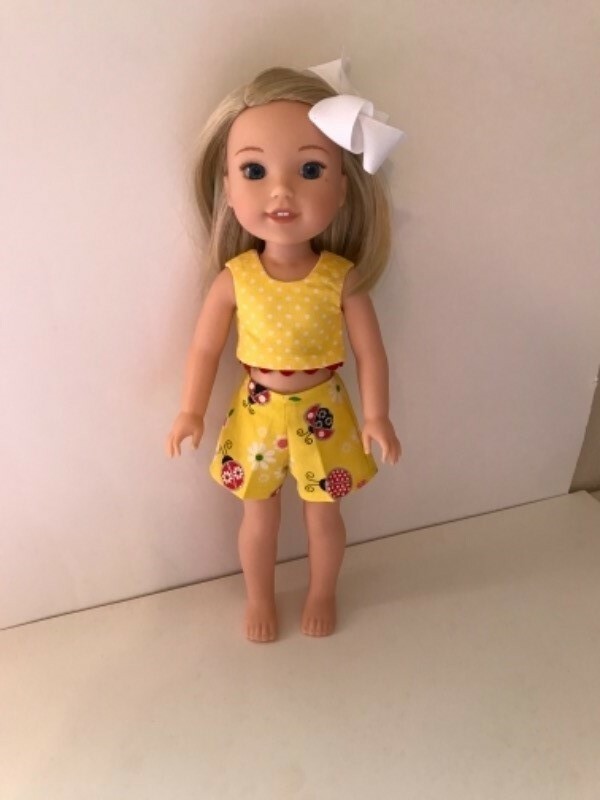 A staple for your doll’s summer wardrobe, the Sandbox Shorts is a pattern you will turn to again and again to create a whole wardrobe of shorts for your dolls. Pair it with the Popsicle Top for a perfect summer outfit! This simple design lets you mix and match fabrics and trims for a new look each time. Choose your leg style: Classic, longer Bermuda, or a trendy Wide leg and add matching or contrasting pockets. With a flat front and back elastic waistband, the Sandbox Shorts are easy for little hands to dress and to sew! This pattern is a perfect starter pattern for girls that want to learn to sew for their dolls, or for more experienced seamstresses to make a basic doll wardrobe with lots of options. This classic but simple pair of shorts is very easily made from a quarter yard of fabric (quilter's fat quarters work great!) in a woven cotton or other lightweight fabric. Mix and match your fabrics and trims for unlimited design options. This PDF sewing pattern was specifically designed and tested on a 14.5 inch WellieWishers™ doll. It also fits Hearts for Hearts dolls with a little looser fit. Please measure and test the fit on your own doll as there are many on the market and it may not fit the same on all of them. 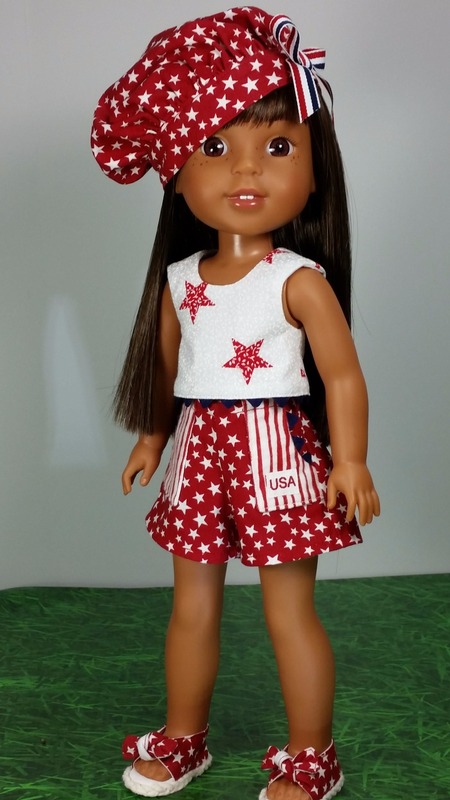 This pattern is available in five great sizes: 18" dolls such as American Girl®, Disney® Animators', 14.5" dolls such as WellieWishers™, 15” baby dolls such as Bitty Baby® and 16" A Girl For All Time dolls. Love this pattern. Easy to follow. Looks great with crop style tops as well as standard T-shirt’s. The pattern and instructions were very easy to follow and the finished product turned out absolutely adorable. I especially like the wide leg version of the shorts - but I've also used the longer straighter version for a custom boy Wellie Wisher. The fit is good and they look cute with pocket on or off. You can't go wrong with this pattern! I've paired it with the Popsicle Top in the photo. Easy to follow directions. Shorts are easy to make in a short time. These shorts were easy and fun to make. The instructions are clear and easy to follow with plenty of pictures. You can change the look by changing fabrics for the pockets and/or shorts or by putting the pockets on the inside instead of the out side of the shorts. They fit well with no adjustments. They go together fast so your doll can have more than one pair.